Rhonda’s love of theatre began at an early age, but she discovered it was a passion when she became an intern at GRCT in 1998. 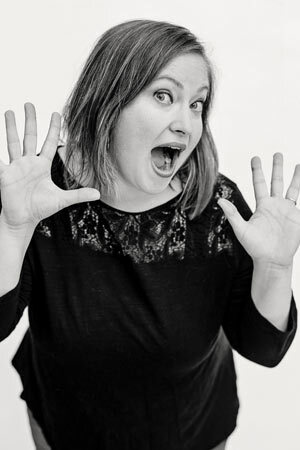 After receiving her theatre degree, she has worn many hats; working in the box office, as a House Manager, Stage Manager, Props and Costume designer and as a teacher at both theatre classes and summer camp. She was even seen onstage a few times! This year she worked as Stage Manager and Assistant Director for Number the Starsat GRCT. Next, she will be designing and building puppets for The Little Mermaid, and then on to designing costumes for a local high school. Although Rhonda loves both stage management and design, her favorite role is TEACHER. For Civic’s educational program, she has taught classes in acting, technical theatre, and summer programs. Outside GRCT, she even created an educational performance based on the life cycle of apples that she performed for local school group tours at an apple orchard! At the Regional level, she was invited to teach the Stage Management Master Class for the Community Theatre Association of Michigan. Rhonda met her husband Jeff while performing in a GRCT production. They have been married for 18 years and have three wonderful children! When not busy at GRCT, Rhonda runs the Mill Creek Middle School Drama Club and is the office manager for IATSE Local 25, Grand Rapids’ professional stage-hand union. Children. They always see so much good in the world and act with their hearts first. Winnie-the-Pooh! He says very wise things, and I usually have a rumbly in my tummy too. My mom would make Cheerio treats! They had Cheerios, peanut butter, raisins, and honey. So good!